The admissions blog isn’t really well known or advertised. Our group didn’t know about the blog until this class, and many of us feel it would have been nice to see it before or during the admission process. Maybe having a link to the blog at the top of the application and as part the the acceptance packet. The mobile layout is frankly terrible. Looking at the page on an tablet or smart phone deters the reader from continuing. Most younger people use mobile devices, and the lack of a visually appealing mobile page is a huge problem. Tag cloud is pretty large and ambiguous. It’s not helpful to the reader at all, and it’s size is visually unappealing. For an admission blog, some of the tags are inappropriate, such as “fr3sh”, and several repetitive tags such as “precalc” and “precalculus”. 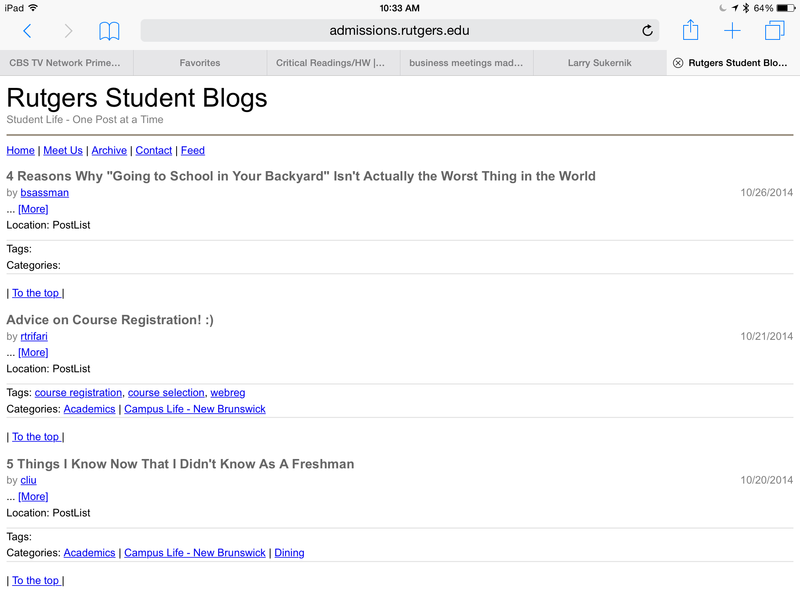 Since the blog is written by various students, it’s hard for the writers to maintain a coherent tag cloud, so it would be better if the admissions blog administrators were to occasionally filter through the tags. The last thing we noticed is that on the home page, the reader cannot see any part of the post. While a whole post would be too much, it would be nice to see the first 3-5 lines of the post to let the reader start reading it and therefore be more inclined to click “more”. A title is not enough to get a reader interested in clicking into the whole article. I actually already started to incorporate some of these suggestions on how to attract positive feedback to motivate myself throughout my fitness blog. I believe it was 2 weeks ago when you had us write down any topics that we would be writing about in the future. The exercise was defiantly useful as whenever I am about to write my posts for the week all I have to do is open up my laptop and see the ideas I wrote down. My advice would be to have it somewhere that you frequently visit just incase an idea comes to mind. For example, I have my list of ideas as a post so every time I open up my laptop I could see what I already wrote about and what I could still incorporate. For my next post I’ll like to write somewhere different as the article states it’ll build up my writing habit. An aspect I’ll like to add to my blog that I believe will attract readers are asking questions on Facebook or other social networks in order to receive different perspectives of fitness. Hence, it will allow me to compare certain parts and could even write a post about how certain workouts could be completely different just from the goal the individual has. I don’t really know how I would feel at the moment involving a twitter chat into my blog discussion or posts since it’s pretty new and I rather get insight from strangers when I’m more established.